As consumer brands see the impact of influencer marketing initiatives throughout the path to purchase, the pressure is on to develop sophisticated, measurable programs capable of supporting large-scale strategies. The challenge facing these brands is to develop an influencer marketing practice that aligns with overarching brand strategy, regional needs and the never-ending beat of product launches, while ensuring leadership has the data and reporting framework required to evaluate success and prioritize spending. Often when a brand is bringing influencer marketing in-house, there is pressure from executives to demonstrate positive results before additional resources are allocated. This can lead to a chicken and egg scenario where a team finds themselves at a standstill because they can’t get the resources they require to deliver the results they need to move forward. On the flip side, it’s equally as challenging to attempt to change your entire process, workflow and team structure at once. This approach will almost certainly lead to chaos and less-than-desirable results. Your performance by campaign and influencer type. Once you've established your baseline for measurement, you’ll be able to make informed decisions on which influencer and agency relationships to continue investing in; which to stop, identify key learnings for your teams and create predictability for management in your reporting format and frequency. If there's a silver bullet to influencer marketing success, this is it! To achieve this, many consumer brands have opted to bring influencer marketing in-house by creating hubs that manage measurement, insights and relationship-building, as well as, coordination across different areas of the business and with agency partners. This guide presents a blueprint for brands looking to establish their own in-house practice to enable strategic influencer marketing programs at scale. Influencers can impact audience engagement across the entire customer journey. As such, influencer marketing requires collaboration from all corners of an organization and necessitates a group of champions to earn executive attention beyond any one function. In our research report, Influence 2.0, based on input from over 100 global brands, half of those surveyed state that four or more departments engage with influencers now. It’s not unheard of for 5+ departments to be dipping their toes in influencer marketing before management decides it’s time to consolidate strategy, reporting and technology. Given the cross-functional requirements of a successful influencer program, the work to scale influencer marketing within a brand demands a focus on standardization, systematization and coordination. 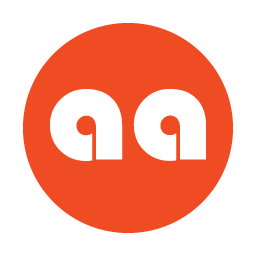 While each brand’s implementation is unique, among the most advanced, patterns are emerging. Most notably, the creation of a centralized hub for influencer analytics which often, but not always, originates within the consumer insights or social media functions. The reality is that scaling influencer marketing in-house is a bit of a tautology; bringing influencer marketing in house is the only way a program will scale. Far too many agencies resist this change because it challenges their position and existing business. However, brands will never significantly scale their work with agencies until the core of their program is handled in-house. We’ve experienced this dynamic first hand in our latest Influence 2.0 report where we see both advanced and tactical organizations spending about the same with their agencies partners, however the nature of the work that advanced organizations ask of their agencies is very different. For example, advanced organizations, are significantly less likely to rely on agencies for influencer identification, activation and campaign measurement. Far from resisting this trend, the most successful agencies are embracing their clients efforts to scale; remaining confident that the role of the agency stands strong, while the nature of their work evolves. An in-house influencer marketing team harmonizes influencer practices and enables the rest of the organization to work effectively, respectively and measurably with influencers of all types. This team will often engage directly with some influencers, working alongside brand teams, which will also have relationships with influencers. 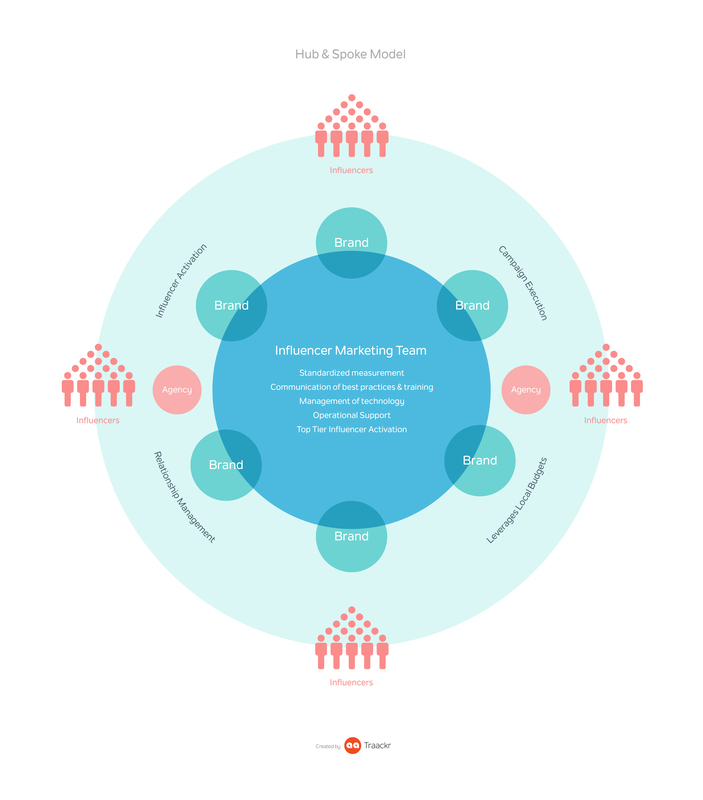 The in-house influencer marketing hub acts as a gatekeeper for their company’s influencer community by consolidating influencer marketing requests from across the organization and translating multiple campaign needs into an always on program that builds and maintains relationships with key influencers over time. As brands bring influencer marketing into their core business, the need to accurately and consistently measure the performance of your investments becomes indispensable. If your organization is just starting out, start here. Maintain one central influencer database or “influencer CRM” to enable consistent and standardized measurement across programs and business units. Provide program level performance measurement and benchmarking, consolidating performance reporting across the organization. Introduce a framework for compliance oversight by providing real-time visibility of all influencer marketing and sponsorship efforts. With technology and reporting in place, the team can begin to provide data-driven insights to teams to maximize their impact. The in-house team will help optimize processes, stimulate collaboration across regions, brands and departments, and provide guidance on influencer endorsements and allocation of resource. Develop your organization’s Influencer Strategy Playbook and establish the rules of engagement for influencer outreach, negotiation and collaboration. Ensure your brands are working with the highest impact influencers by providing data-driven influencer discovery. Surface lessons learned from campaigns across the organization and provide insights to teams developing new influencer collaborations. With measurement models in place and best practices documented, the in-house influencer marketing hub can focus on scaling and expanding influencer programs throughout the organization. 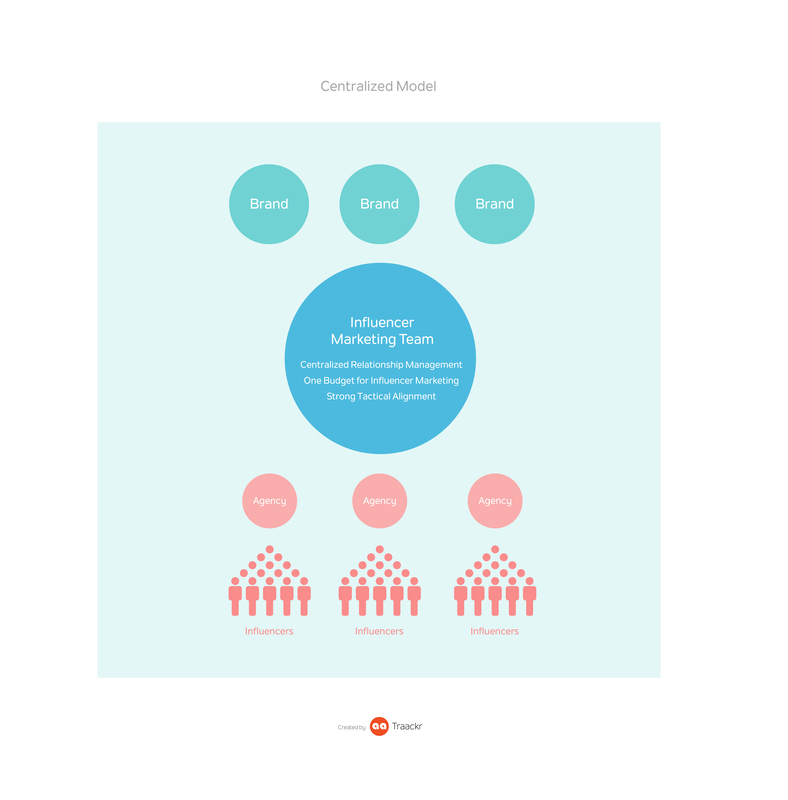 Ensure influencer marketing is integrated across functional areas within the organization including, but not limited to, marketing, communications and product. This team may be responsible for employee advocacy or other community management programs. Provide a cohesive brand experience for influencers who are working with you. Liaise with brands, business units and regional teams to identify influencer needs based on brand goals and upcoming product launches. Conduct training for internal stakeholders on influencer relations, outreach strategies and the technology available to them. When Chelsea Riggs, Brand President of amika, wanted to grow their influencer program, she knew their team organization needed to evolve. Read more about amika’s influencer program in Staging A Brand Rebellion. Regardless of where it ultimately sits within an organization, the talent required to scale and execute influencer strategies requires a new blend of skills including integrated marketing communications, social media, public relations and analytics. Within a brand, the influencer marketing team is equal parts analytics warehouse, strategic advisory, and relationship builders. To support influencer marketing at scale, a core team of communications and marketing professionals collaborate to deliver a unified strategy, methodology, measurement framework, and tool set that supports brand storytelling, product launches and community building for one or more brands. There is no single best practice for where an influencer marketing team should sit within an organization. Regardless of its position within the organization, the remit of the team must be to enable all relevant parts of the brand to collaborate on influencer strategies. Typically, organizations will start in the same way with influencer marketing organically taking place throughout the organization on an ad hoc basis. This phase is marked by little to no process or measurement standards and eventually culmonizes in an ambition to consolidate and optimize so you can scale. What typically evolves is one of two models: centralized or decentralized. Neither is right or wrong. What matters most is that the model you choose is aligned to your brand’s culture and organization. “We used to operate a company-wide PR and social media strategy that was well established by brand and region but lacked a system approach and specific methodology to influencer marketing,” explains Santiago Garcia Solimei, Global Director of Social Media. In January 2017, we made the switch to a system-based approach. The move was a response to the increasing number of influencer requests being received at the hotel, regional and global levels, plus the amount of time needed to evaluate, consider and respond to all those requests. Our systematic approach, driven by Traackr, has given us the benefit of a consistent method to identify, validate, respond and report on influencer related proposals. Read more How Meliá Hotels International Scales Influencer Marketing Across 7 Brands and 4 Continent. Concretely, members of an influencer marketing team support large-scale influencer programs ensuring a solid foundation that provides, structure, insights and governance for the brand. Depending on the size of the organization, there will be a least several full-time positions dedicated to in-house influencer marketing. On a regular basis, the team will take on the following activities. Manage a brand-wide influencer database where essential information on each influencer can be stored including outreach, content and engagement tracking, as well as, task management and relationship history. To take influencer marketing from a tactical project to a strategic program, a brand requires a “CRM for influencers” to scale the number of authentic relationships under management and make data-driven decisions about how to spend influencer endorsement, gifting programs and sponsored content budgets. An Influencer Relationship Management system will enable organization-wide performance measurement and reporting. Provide a framework for consistent and readily-available measurement across influencer programs and campaigns. This includes regular production of benchmark Share of Influence reports and building up strong historical data sets related to influencer activities that enable the development of attribution models. The in-house insights team works closely with agency partners to ensure any work down externally is measured consistently. Brands are no longer relying on black box metrics like EMV to measure influencer programs. Instead they are taking a holistic approach to measurement that matches the right key performance indicator (KPI) to the program, based on business goals. If you are just starting out with influencer marketing, it’s best to demonstrate your commitment to measurement early on and take a “crawl, walk, then run” approach. Many programs beginning by measuring activity (program inputs), then extending to outputs (direct results of your actions) and evolving to include outcomes measurements (impact on business objectives). Like all marketing programs, each influencer activation will have specific business goals and should be measured appropriately. Read more on best practices for influencer marketing measurement. Leverage technology to provide crucial data about influencers’ audience size, demographics, behaviors and engagement levels, as well as, insights into which channels, brands and topics are most aligned to a specific influencer. Deliverables include short-lists for brand leaders to evaluate and reports on past performance specific influencers (ex: benchmarking an influencer’s performance when discussing your brand or competitors.) It’s also critical to empower this team to assess influencer fraud risk and systemize a process for reviewing influencers. Read more about how Traackr helps you detect fraudulent influencers here. Ensure a unified experience for influencers with your brand. 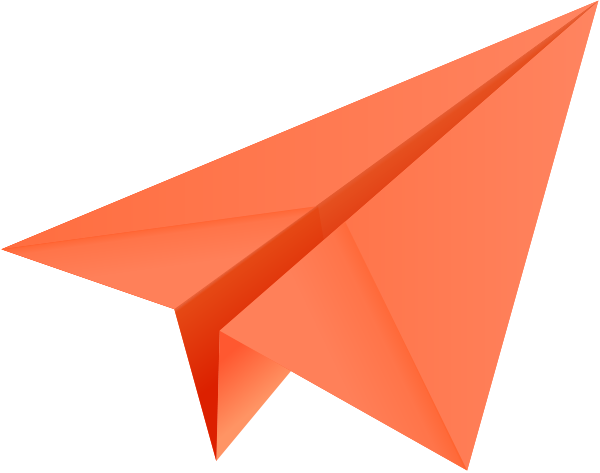 Product launches, events and campaigns all come and go, while relationships are built over time. Many brands hire influencer engagement coordinators to monitor for up-and-coming influencers, ensure influencer communications stays strong between campaigns and keep a pulse on which influencers generate organic brand mentions. From a business perspective, senior influencer team members will work with procurement and legal teams to put in place best practices for influencer negotiations. Work closely with legal teams to ensure compliance with regulatory requirements, including disclosure, and monitor influencer engagements for contractual requirements where applicable. Beyond legal requirements, compliance extends to establishing and maintaining brand guidelines for influencer programs, including influencer vetting, content, compensation and engagements across the organization. Read more about how brands avoid FTC sanctions by tracking for properly disclosure. Read more about Sipsmith’s approach to scaling influencer marketing. The rising investment and global scaling of influencer programs requires marketing and communications functions to rethink the structure for how influencer work is accomplished across their organizations. The role of an In-House Influencer Marketing Function is to provide a brand-wide framework for optimization of resources, coordination of efforts and mitigation of risks associated with scaling influencer strategies. Ultimately, these teams will support their organization’s transformation and empower all internal stakeholders to connect with their audiences in meaningful ways at scale. If you’re just starting out, don’t get overwhelmed. Start by setting your organization up for success by establishing an influencer marketing measurement practice. As you develop your measurement framework and demonstrate consistent performance reporting, you’ll have a foundation from which to earn greater executive buy-in. Your reporting frameworks will help your organization understand the impact of influencer investments and will enable the in-house team to provide data-driven insights to the organization to optimize influencer marketing. Before you know it, your in-house influencer marketing team will be ready to scale to the next level, working authentically with larger groups of diverse influencers, across more business units and geographic regions. 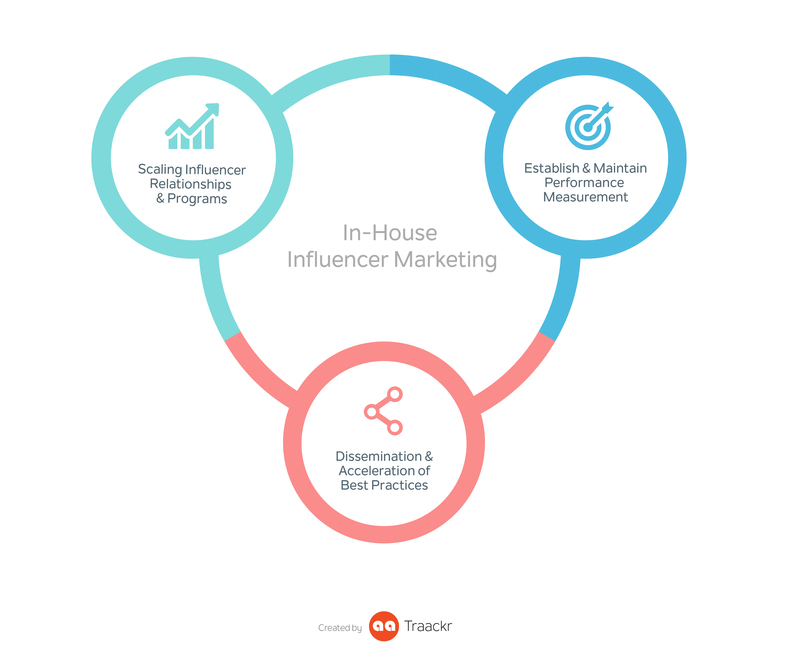 Learn more about how Traackr supports influencer marketing at scale with an end-to-end influencer discovery, relationship management and analytics solution.